A lot of people believe that you need to go through a laser teeth whitening procedure, in order to have brighter smile. It is true that this must be one of the options when you consider any teeth whitening procedures. The laser treatment has its own benefits, but there are significant drawbacks that need to be highlighted as well. Laser teeth whitening is carried out through two different techniques. 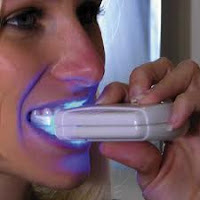 First of it involves the use of a whitening gel and second is the use of the ultraviolet lights. It is one of the teeth whitening procedures which need to be conducted by the dentist. The procedure begins with the application of a whitening gel, followed by the use of the ultraviolet rays. The lights would activate the components of the gel and release the oxygen in the innermost parts of the teeth. Laser teeth whitening process has become exceedingly popular since a lot of people are becoming conscious of their smiles. The process can whiten your teeth, regardless of how stubborn the stains are. However, just like the other processes, there are a few steps that you need to follow. Firstly, the dentist would remove all the debris from the teeth. Thereafter the gel is to be applied on the teeth and thereafter the lights are focussed on the teeth. The gel would be converted into crystals and then absorbed by the light. The gel penetrates deep into the enamel and then provides whiter teeth instantly. Although the results are instantaneous, the teeth whitening process may perhaps not be recommended to all. Such a concentrated process is possible for only those people who have stubborn stains on their teeth or who have never undertaken any whitening procedures before. The laser treatments take about one hour per session. Off lately, in addition to the benefits available with this teeth whitening process, there are a lot of drawbacks which restrict people from going through this procedure. To start with, one of the biggest drawbacks is the cost attached to laser teeth whitening procedures. Compared to the home teeth whitening kits, laser treatments can typically cost a few thousand dollars. There are quite a few side effects attached to the laser treatments. Some of the side effects include sore gums and teeth which are caused by the bleach in the whitening gel. Some of the patients have also complained of extreme sensitivity while consuming hot or cold beverages. Even if the bleaching is effective, it is not recommended for people who have chemical sensitivities. You are required to inform the dentist about any of the existing conditions. Due to the instantaneous results offered by the treatment, it happens to be one of the most sought after treatments. About 78% of patients have reported effectiveness after the laser teeth whitening processes. If you cannot afford thousands of dollars for such a procedure, you may also consider some of the home teeth whitening kits which are pretty effective as well.